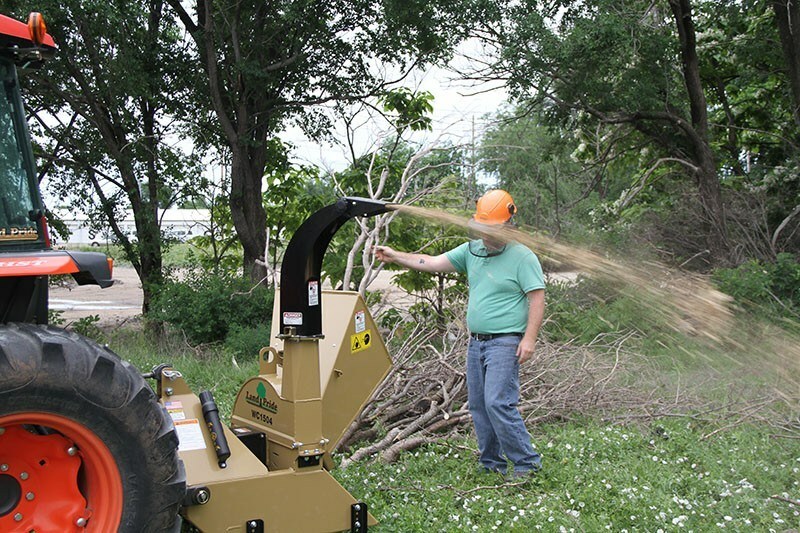 Land owners can utilize a Land Pride Wood Chipper and their subcompact tractor to quickly turn mountains of limbs into chips for mulch or just to aid in decomposition. 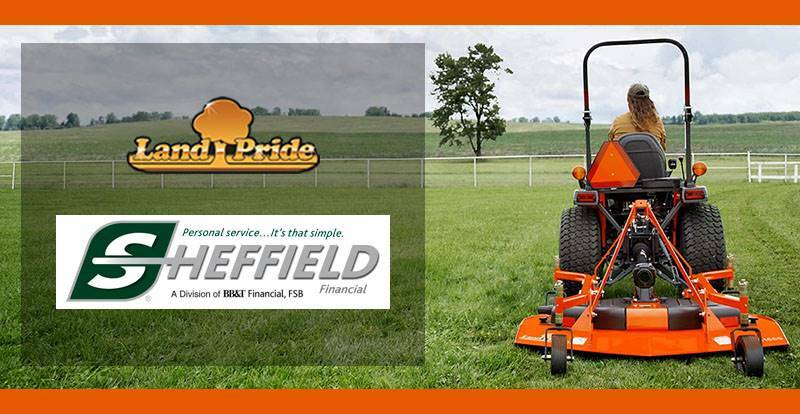 Driven by the tractor's PTO, this unit features a self-feeding 4 in. cutting capacity, four reversible and replaceable hardened-steel knives, adjustable discharge chute, and direct drive to rotor. 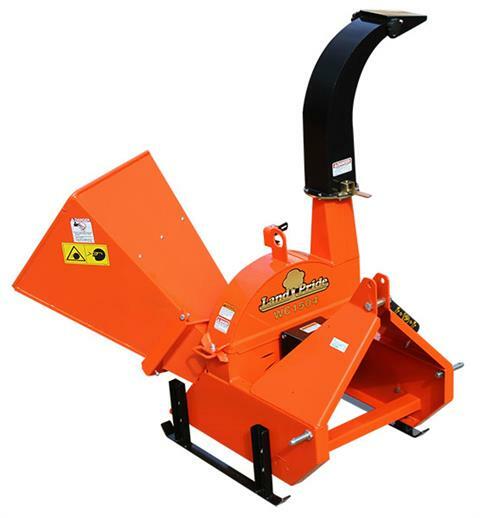 Adjustable support stands help elevate the Wood Chipper to match the height to your tractor's output shaft, enabling the driveline to remain straight and level. KNIVES: Rotor features 4 replaceable 1/4" hardened steel cutting edges. Each knife has two cutting edges to extend knife life. When one edge is worn, rotate knife 180° to a new cutting edge. Less downtime required to sharpen knives. ADJUSTABLE ROTATING DISCHARGE CHUTE WITH ROTATION STOPS: Directs direction wood chips will be discharged. Chute rotate stops keep the chute from discharging chips toward the operator feeding product toward the feed chute. SELF-FEEDING SYSTEM: Product is pulled in by the sharp cutting knives with each pass of a knife. 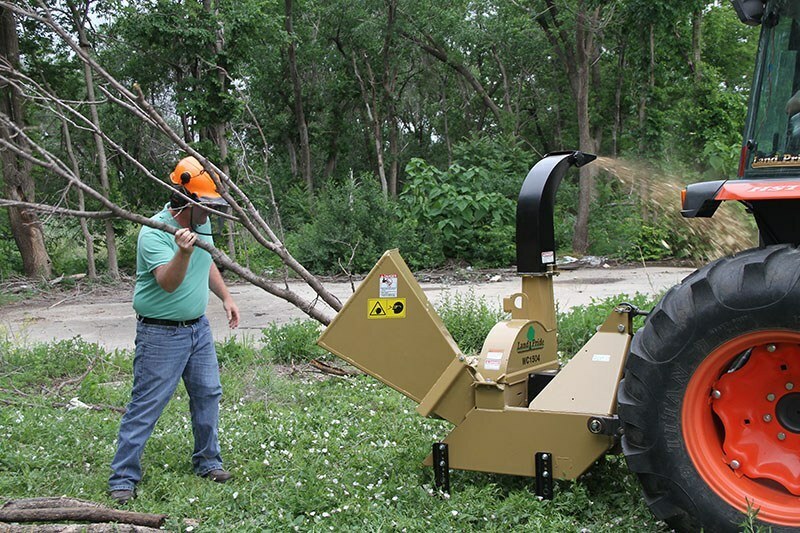 Operator can be retrieving the next object to load while the unit is chipping the last limb loaded into the feed chute. 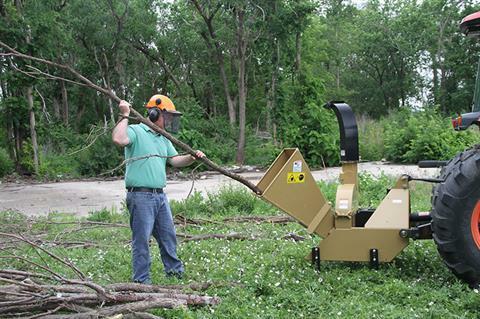 SKID EXTENTION SUPPORTS: Allows the unit to sit on the ground while keeping the driveline near level. Extends life of driveline u-joints. CAT. 4 SHEAR-BOLT DRIVELINE: Shear-bolt protects the unit when obstructions are encountered. 5.25 in. square opening; 270° positioning; Height - 58 - 64 in. Upper Hitch Plate Thickness - 0.31 in. 25 in., Speed - 540 rpm, Housing Thickness - 0.19 in.